I was a little excited when I first opened the box and saw some sort of ear cleaning solution. I am slightly obsessed with cleaning my ears, I use Q Tips daily. I also recently tried a product where I get to rinse my nose and clean out my sinuses and that went well. This product was similar in functionality and the contents of the solution. The product indicated that one should NOT use this product if they've had perforated ear drum or if they had tubes in their ears. I perforated my ear drum when I was 18 but I believe it has healed so I went ahead and used the product. I held the bottle up to my ear and squeezed it into my right ear. It felt very strange, very strange, at first. Shocking almost. The fluid is cold as it rushes into your ear and I found myself jumping back and shaking my head. The fluid then rushes out of your ear and all over the floor. So be sure to do it in the bathroom. My second ear was not nearly as shocking as I knew what to expect. My plan was to try the product several times before writing this post so that I could see what repeated use was like. The bottle says it takes a few times until the ears are cleaned out. Unfortunately, I did not try it again. 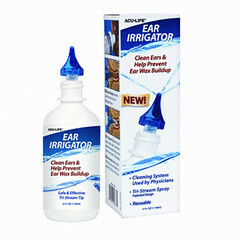 The day after I tried the Ear Irrigator, I woke up with a tingle in my right ear. That all-too-familiar tingle that I get when I am about to have an ear infection. I stopped using the Ear Irrigator immediately. I believe that due to my chronic ear problems with my right ear, I am not the appropriate person to test this product.